When aircraft are going hundreds of miles an hour @ 20,000+ ft who notices?? But when those same aircraft are doing some speed at an altitude that can be measured in single digits... well NOW there's something to see. Last edited by mpa; 27th March 2007, 18:16.
another such run by same formation probably. if I'm not wrong, there is a pic on the web for a car that lost it's roof ( I don't know what to call the upper part of a car ) after being hit by a low flying Jaguar on some road in Oman . 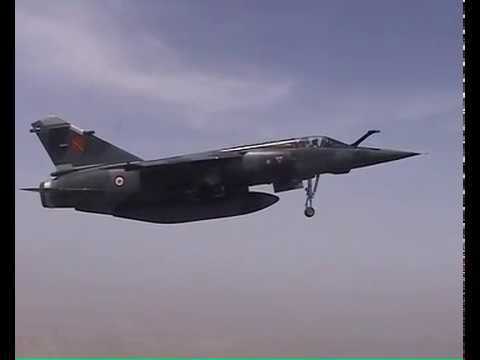 Mirage F1CR over Chad during operation "Epervier"
Years and years ago on a rainy day I saw a F-111 zipping across an autobahn in Germany, maybe 200 yards in front of our car, must have been only a 100 or 120ft AGL. It passed so fast it took me a couple of seconds to realise what just had happened. And down in southern Greece in 1979 or 80 (can't remember), on the Peloponnes peninsula near a small hamlet called Koroni, in July and August a formation of two F-8 made an almost daily wakeup call - really low, jumped over the rocky finger our bungalow stood on, only acouple of meters AGL and swooped down across the beach in the cove to the east. An during another vacation in Greece a few miles north of Cape Matapan (or Tenaron as they call it nowadays) first at least two formations of four USN A-7E each flew extremely low along the cliffs there, dodging rocks and using those ragged rocks to mask their flightpath. And the road there runs right along the cliffs, so for about twenty seconds there were Corsairs zipping all over our car. And then later right on Cape Matapan (there is a small chapel and some mounds that shield the sea from direct view) two Greek F-4 came in VERY low and almost at the speed of sound across those mounds. Only one or two seconds or so you could hear a hiss and then suddenly a Phantom was standing in the sky (or so it seemed) right in front of me, maybe 30ft above those mounds and a 100ft away from us. The next moment it was gone and you could smell it and feel the shockwave. Wow! Pretty sure they used that chapel as navpoint. Of course in Nevada you can see - on a good day or during Red Flag - a lot of planes. Saw a MiG-21 once. And there is a place on Hwy.375 calles Koyote Summit where they used to have a Roland and made simulated attack runs against it. F-15, F-16, F-18, B-1, all very low and sometimes fast. Goldwater Range (Hwy.95 I think) was also a good place to view and hear A-10 shoot their GAU. But I think the times when the USN/USMC chased cars down the highways around Fallon are gone. Better chances that some cropduster chases you down on some tripple-digit Georgia highway (you shouldn't drive a Wrangler then ). Last edited by Distiller; 19th February 2004, 11:11. Fake probably, The underside of the aircart is in shadow, look at the reflection in the water, it looks like someone has just cloned a reverse image of the f111 and stuck it upside down and blurred it a little, its not even in shadow. Last edited by aerospacetech; 7th December 2006, 07:20. IMHO pix where you can see the shadow of the aircraft on the ground are the best. Why not some movies? Enjoy! Last edited by halloweene; 22nd December 2014, 13:15. 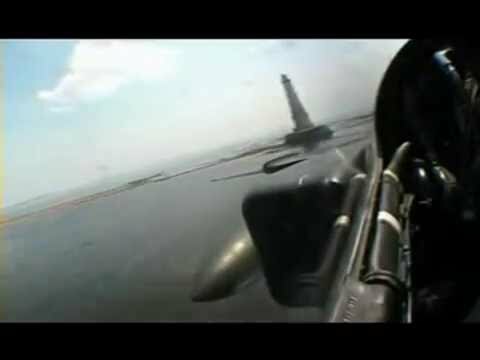 I was waiting for someone to post the Chad Mirage F1 video clip. I guess we can safely close this thread now, its pretty much perfection. Last edited by halloweene; 22nd December 2014, 16:31.